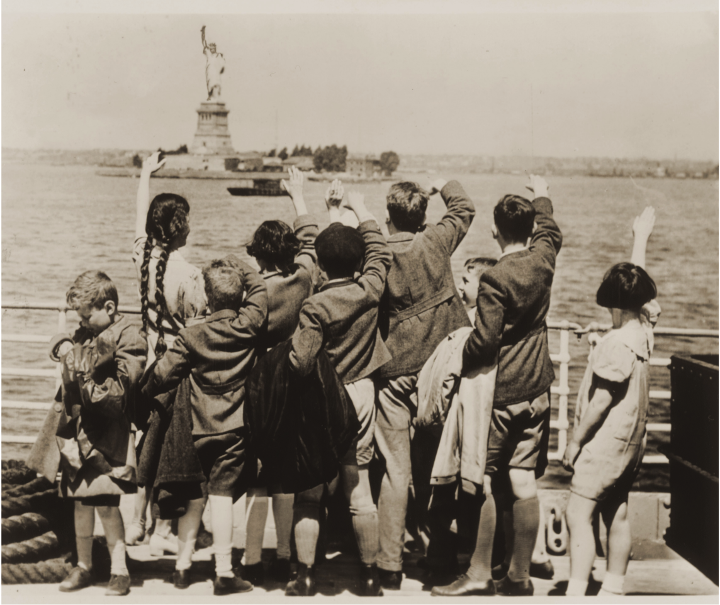 Jewish refugee children wave at the Statue of Liberty as the President Harding steams into New York harbor, June 3, 1939. United States Holocaust Memorial Museum, courtesy of Anita Willens. At the height of the Nazi threat, two young German Jewish sisters fled Europe on the cusp of war to Newark, New Jersey, unaccompanied by adult kin. At their mother's behest, the daughters turned into prodigious letter writers. In their correspondence, the girls boasted of their seamless adjustment to American life and the tender care lavished on them by their American foster parents. They also never failed to assure their mother of their constant longing for her, routinely including in their letters fantasies and poems about their eagerly anticipated family reunion. The younger Gaby would offer pencil drawings of the three of them together; the elder Yutta adopted an especially mature and protective tone in her letters towards her mother, her "darling one." At one point she suggested returning to Europe if her mother felt too "lonesome," and elsewhere in their multiyear correspondence she remembered to keep her abreast of developments in securing her mother a visa. Their mother, in turn, insecure about her place in her daughters' hearts, constantly urged for details of their lives in America and their emotional inner worlds. The letters bear witness to a trying few years in the life of a war-torn family. They uncover a seemingly topsy-turvy family hierarchy— children migrating ahead of adults and throwing themselves into the heady process of family migration and acculturation. The experience of the Losser daughters was shared by other Jewish youth over the course of modern Jewish history. Between 1870 and 1924 two and a half million east European Jews—in proportional terms, one third of east European Jewry—bid farewell to friends and family and migrated to the United States. This is a familiar story. What is less familiar is that this mass of migrants was also a young body of migrants: one quarter had not yet reached the age of fourteen. In most cases, these youth made the monumental trek as part of a family unit. However, what remains inadequately documented is that from the 1870s through the 1950s waves of unaccompanied Jewish youth traversed continents and seas as they made their way abroad. In some cases, these young people pushed their way westward, largely independently, to join relatives who had migrated years earlier or to carve a brighter future for themselves on new shores. In other instances, these minors were assisted in their move by Jewish child migration programs that sought to spare them from violence and poverty or, in later years, a life of limbo in the European Jewish Displaced Persons camps. Like most immigrants, mobile youth were a selfselecting lot. Those with promising lives and positive affiliations with Europe presumably remained on the continent, whereas migrant youth had little to anchor them at home. Poverty, pogroms, the bloodshed caused by the Great War and the Russian Civil War, and the Holocaust all sparked Jewish youth flight. Their stories have fallen through the cracks of multiple scholarly fields. The history of migration has enjoyed relatively fertile scholarly attention that has only mushroomed as of late. Most recently, scholars have questioned the narrative of a one-way trajectory from Russian oppression to American acculturation by showing how, be it by choice or circumstance, new Jewish communities fanned out across the globe. They have also muddled a historiography that has drawn an all-too-stark line between the sending and the host society. These scholars have revealed how bonds of belonging to the Old World were not irrevocably severed upon setting foot in the New World. But the fact that a staggering percentage of European Jewish migrants had not yet reached adulthood has been noted in passing and yet never accorded sustained exploration. What happens if we look beyond the standard attention paid to migrating adults? What if, instead of writing migration history through the lens of class, men, women, or gender, we include age as a category of analysis to that list? I would like to briefly introduce one conclusion. Primarily, integrating the perspectives and experiences of minors would underscore the role of youth as active agents in the act of migration. Several popular perceptions have obscured the agency of youth in the migration process: youth are generally regarded as passive and dependent, and the nuclear family unit as a hierarchical structure in which children languish at the bottom. These assumptions don't hold up to historical scrutiny, or even the images we currently see on the nightly news of mobile youth fleeing bombs in Syria or drug warfare in South and Central America. Youth could take the lead in migration, even when it led to generational conflict. If emigration confronted adults with deep potential loss, youth could face great gain. Emigration forced adults to bid farewell to assets and treasured kinship and friendship networks accumulated over a lifetime. For instance, even during 1930s Nazi Germany, adults anguished over whether the benefit of liberty outweighed the prospect of an uncertain life of toil abroad. Youth, who arguably had the most to lose from constricted socioeconomic horizons, could embrace starkly divergent positions from their elders. One Nazi-era teenage refugee reflected in the 1940s on the differing generational perspectives: "I was thrilled at the prospect of a trip abroad, even though I knew that I was leaving behind me several things that I would miss later. I was sad because of the influence and the state of mind of older people, more conscious of the difficulties that would confront them." Migrant youth could urge reluctant parents to flee a perilous situation. For example, memoirs reveal that German Jewish youth were often most attuned to the disturbing rise of social antisemitism, and championed migration despite the initial reluctance of their parents. Or they could see migration as an exciting adventure, rather than a burden. Younger male refugees from Nazi Germany, for instance, envisioned a New World peopled by cowboys, Indians, and gangsters. They found themselves rather disappointed by the far more prosaic reality. In some cases, children and teenagers made the heart-wrenching decision to leave family members behind as they attempted to chart their own futures. Thus, an image of determined and active children forcefully emerges that unsettles assumptions about the passivity of child migrants and their position at the bottom of the family hierarchy. In spite of youths' efforts to assert their will, twentieth-century adults did not necessarily heed their preferences. Multiple factors could serve as obstacles toward children's self-determination: adults initiating and overseeing the migration of their young relatives; politicians and Jewish communal activists making decisions about the destination of young migrants; gendered expectations that limited the mobility of females; and common perceptions about the ability of youth at a certain age to know (or not) their own mind. An image of determined and independent youth emerges in this history of child migration, but so too does the growing power of international agencies that sought to aid children but that also inevitably came into friction with them. Paying attention to the history of Jewish unaccompanied migrants helps remap our current understanding of Jewish migration history. Integrating this history sheds light on the multiple, and sometimes competing, causes and actors of migration. But it also can help address problems vexing our contemporary society. The matter of unaccompanied child migrants has currently dominated the front pages of the press and the concerns of politicians, families, social workers, and judges. As has been amply documented by scholars and journalists alike, minors are currently moving around the globe en masse to flee gang violence in Latin America, warfare in the Middle East, and poverty throughout the globe. Multiple parallels emerge between these two often woeful histories. Increased scholarly attention to the long history of Jewish migration, social responses to economic instability and persecution, the work of philanthropies and diasporic communities, and the critical role of children in these histories can inform contemporary national conversations. 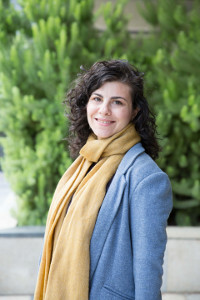 Daniella Doron is a senior lecturer in Jewish History at Monash University. She is the author of Jewish Youth and Identity in Postwar France: Rebuilding Family and Nation (Indiana University Press, 2015) and several articles on French Jewish history, postwar Europe, and the history of childhood, family, and gender.